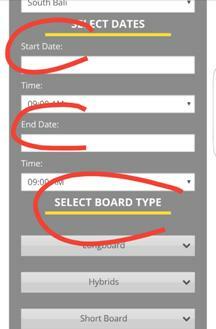 To book, simply select your dates and category of board you are looking for. It will show you availability and price for the period selected. For booking, you only need to pay a deposit of 12%, the balance is to be paid when you collect the board. We like boards, we like high tech and nice shapes, that's the reason why we offer the best brands, innovative products like the carbon cybertoys by Mike Woo, bamboo core, Hypto Krypto... All the boards we like and try to caters all the tastes. We are all surfers and we know how it can be frustating not to have the right board to enjoy the best waves of the world. With us you can relax, you will always get a quality board. WHAT HAPPENS IN CASE OF A PROBLEM WITH MY BOARD ? We do not have insurance, however all risks are listed and quoted, so that there is no bad surprise. In Bali there are plenty of boards for rent or for sale at very cheap price. But be aware most of the boards have been damaged or snapped many times, and painted many times. At rentasurfboard.com, we don't rent any broken board, once a board is not in good condition anymore, we sell it or give it to local kids. All our boards are in good condition and you have the possibility to swap your board if you are not happy with your first choice. Wherever you stay in Bali, we can supply you the board of your choice . Our center offers drop off and pick up service. (from 9am till 6pm) You won't even have to leave your room to get your surfboard. 20 USD if you stay in Nusa Dua, Uluwatu, Bingin, Dreamland, Balangan, Sanur, Keramas. ps : Motorbike rentals with surf racks can be arranged with our center. Berawa beach : powerful beach break with many different peaks, works better mid tide. Echo Beach : Most iconic wave of Canggu with a few beach breaks and reef break of high reputation. Take off quite fast and barrels wait for you. Right handers available, which is quite a good thinh to know in lefthanders paradise. Batu Bolong : (Old Man) The spot for longboard and mini malibus. Mellow wave on a reef, slow and very easy. Right and left handers available. A bit crowded but always enough space to catch a few. Bali Ocean surf Surf lessons and surf guiding. Indosurflife.com : plenty of information about surfing in Bali, swell forecats, activities, nightlife and plenty of useful tipes to make your surf trip in Bali a memorable one.